Thirty-five works by Pablo Picasso, Eduardo Chillida and others were stolen from a warehouse south of Madrid on 27 November. 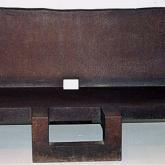 Police were tipped off that Chillida's bench-like 'Topos IV', worth 800,000 euros (£675,000), had been offered to a scrapyard for 30 euros (£25). The haul was found nearby. When the heist happened last month, the art works had just been brought back from an exhibition in Germany and were all still in the truck in a warehouse in Getafe, on the outskirts of Madrid. Thieves broke into the warehouse and drove off with the lorry-load of art, with a combined value thought to be more than 5m euros (£4.2m). At the time, detectives said the robbery looked like "an inside job". But given the discovery of the haul just a few miles away, and the attempt to offload a sculpture for scrap, a police spokesman said "it now appears more likely that we are dealing with amateurs". No arrests have been made yet in connection with the heist.